The president appeared before the American people last night. Markets waited for good news — or bad news — to come issuing from his mouth. Would he announce a pending China trade deal? Conversely, would he threaten another shutdown if Congress won’t fund the wall… or announce a state of emergency? Markets could swing in either direction, depending. No chum went into the water, no dog’s bone went tossing onto Wall Street. Nor was any blood drawn, and no fang broke any skin. The president instead ladled out a pot of porridge… as is typical of State of the Union addresses. 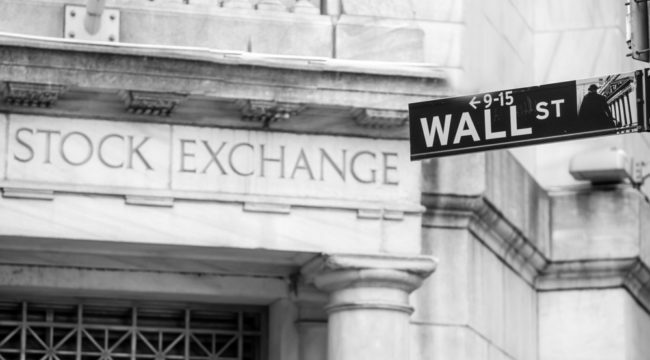 Dow futures held steady throughout… as did S&P futures. There was no escalation of tensions — at least not meaningfully. There was no talk of using commander in chief military powers to build the wall, for instance. That might be considered a win for investors, who prefer it when things do not escalate. Today the collective shoulder shrug continued. The major averages ended the day lower… but slightly. “How Hard Is It to Be a Stock Market Bear Right Now?” asks a MarketWatch headline this morning, pointedly. Rather hard is its answer — and for cause. After December’s near-bear market, the stock market put in its best January in 32 years. And so the bulls have regained their jaunty bounce. Have market conditions brightened measurably? In one month no less? The January unemployment report trounced expectations. Nonfarm payrolls surged by 304,000 — the most in nearly one year. A Bloomberg survey only projected a median estimate of 165,000. On the other hand, the fourth-quarter earnings season is in swing. And results to date have been mixed. Moreover, the earnings outlook for 2019 appears dark. Earnings are deteriorating even faster than we expected. The earnings revision… over the past month has been even more negative than we expected, leading us to think our earnings recession trough in the U.S. could be later than [the first quarter] and deeper. Markets are said to look ahead — not back. Shouldn’t markets be choking on a possible earnings recession? In early January Jerome Powell lifted his foot from the monetary brake pedal. He said a wait-and-see approach would govern him. And at the end of the month he issued markets similar assurance. He further suggested he is prepared to lay off the balance sheet. Is it coincidence then that the stock market turned in its best January in 32 years? But above we referred to central banks — plural. The Chinese economy is slowing to a crawl. In response the central bank has reopened the liquidity taps. Over one January week alone, the bank emptied some 1.1 trillion yuan of liquidity into the market. 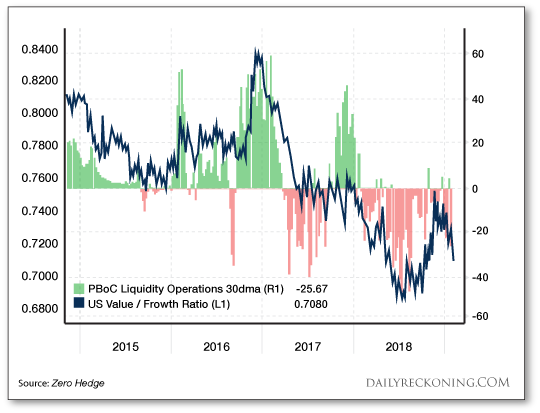 Look no further than the below stunning chart of PBoC open market operations… relative to the key value/growth ratio for U.S. stocks. If there was ever any doubt that the relative performance of U.S. stocks — and especially FAANGs/growth names — is a function of Chinese liquidity, it can quietly be put to rest. The FAANG stocks are of course Facebook, Apple, Amazon, Netflix and Alphabet (Google’s parent company). These stocks are heavily exposed to China. They in turn weigh heavily in U.S. indexes. Each, incidentally, is up on the year — some of them substantially. The correlation is not precise — but the chart certainly gives the flavor. Can you therefore expect the present rally to continue if Chinese liquidity flows? Not according to Maleeha Bengali, CEO of MB Commodities Capital. This break above [S&P] 2,600 could be a red herring… This liquidity boost seems to be temporary. Once the sugar rush is over, equity shall return to its path of least resistance. For now, that is down. After the squeeze from December lows, it is teed up perfectly to perhaps retest the lows of December. At least that is what the fundamentals are saying. But which side will win the battle, the fundamentals — or the central banks?